Here is my Friday Favorite - OPI Warm & Fozzie. This also serves as my "W" for the Alphabet Challenge. Warm & Fozzie and Designer De Better are the only two I grabbed from the 2011 OPI Muppet Collection. I love both of them, but regret not picking up some of the other shades. I have tried getting dupes of Rainbow Connection and I wish I would have picked up the real thing. Also, Gone Gonzo, Divine Swine, and Fresh Frog of Bel Air look so cool too. Okay, get over it Essie.... back to Warm & Fozzie:) Did I mention this is a favorite?? I love the dimension of this polish. It has brown, copper, gold, and rose/red flecks. It is so beautiful! It reminds me of leaves turning colors in the Fall. Obviously a great Fall color. This is gorgeous! I love all the different colors of glitter! I missed out on the Muppets collection and I want them all! 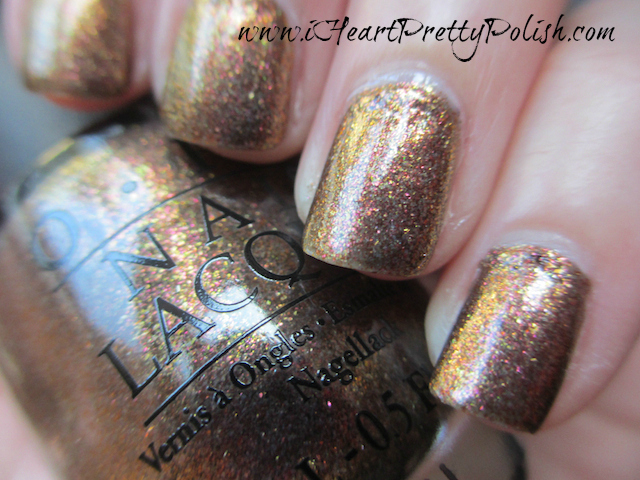 This is so gorgeous- perfect color for fall. I bought it last year and never used it. I'll have to change that this fall! Does Rainbow in the S-Kylie have sparse glitter? Or do you get a pretty good amount? Yep, it's perfect for Autumn! So pretty, definitely says "fall" to me! My gosh, this looks awesome!!! I have this in a mini version and haven't tried it yet because it looks kinda boring in the bottle. Now I see I'm wrong!!! Gotta try it! Yep, gotta try it, especially in the fall! Yep, and I am finding lots on Copious!